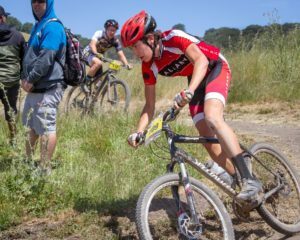 Albany fielded 21 riders in six categories at Granite Bay, and not one of them had to leave the race for a technical. Good maintenance, team! And also thanks to our team of parent-mechanics — Jose, Dana, and Frederic — who disassembled and reassembled Niko’s bike so he could go out and have fun. Armaan, George, and Gabe weren’t able to join us on the beautiful and technically challenging, 6.3-mile course at Granite Bay, but we look forward to sharing the trails with them next time. 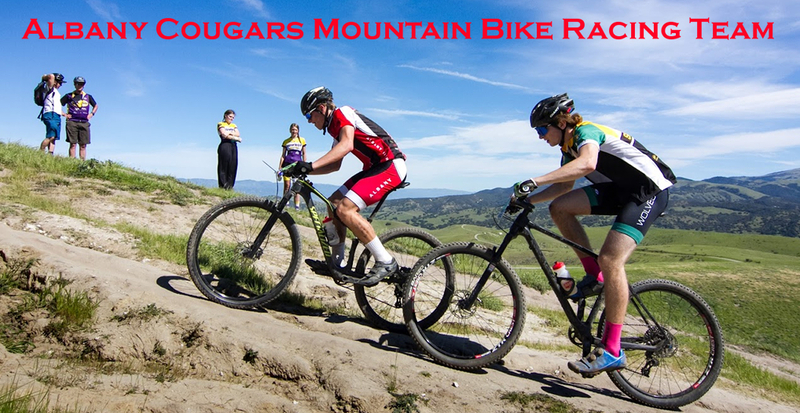 This course featured swooping turns through the lush forest, frequent, short climbs, and some nice rock gardens. 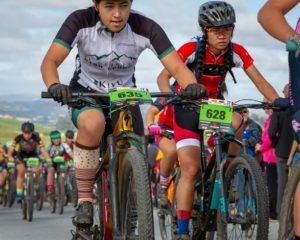 While some Cougars pre-rode the course on Saturday, the late start time Sunday let a good number take their turn ahead of the girls’ race at 9. 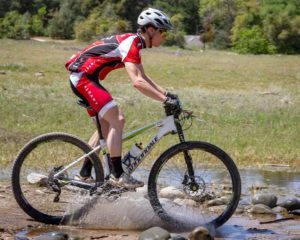 It’s a challenge to pre-ride before the race, which Zack can tell you about. Actually, the course wasn’t the problem. The problem was the parking lot! Zack showed up at the tent with scraped knees, a bloody chin, and a look of disbelief on his face. 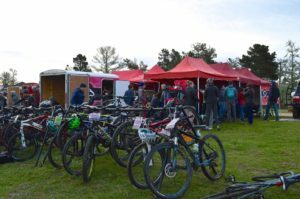 Fortunately, the injuries were minor, the First Aid tent was ready, and his bike was OK. Thanks to Zack’s cautionary example, the rest of the team managed to cross the parking lot without incident. 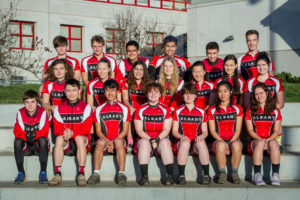 In the actual racing, the Albany High School girls acquitted themselves well again. 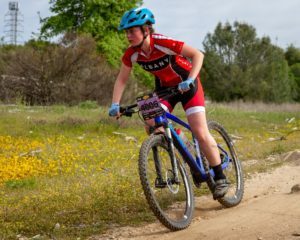 In the first stretch of lap 1, JV rider and team captain Abby was off to a good start in 6th position, which she improved upon enough to win a spot on the podium after two laps. 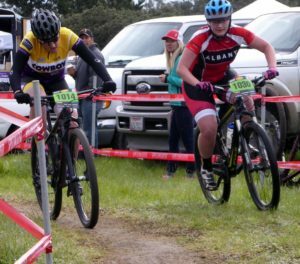 She looked confident and full of energy out on the course. Dylan and Claire finished the course and reported that they had had a good race. For Claire, that was her third time around the course that morning, having pre-ridden with Assistant Coach Marion, all on the heels of a day of skiing Saturday. No word on whether she went sky-diving on the way home after the race. Sophomore girls again showed up very strong. Victoria crushed the start of the race, starting out at third. 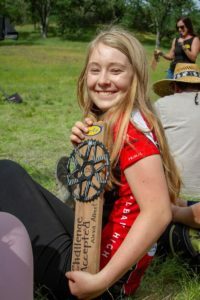 Despite getting stuck behind a rider from another category for a while, she finishing in third in 1:08:12.51, and represented the team on the podium again. Everyone who saw her said she smiled the whole way. Ella and April followed Victoria across the finish line in 7th and 8th positions, just three and a half minutes later. Ella was spotted riding aggressively out on the course, and April said she did better than she expected. Two minutes after them, Bird and Nicole took 10th and 11th positions. Bird kept her cadence up by replaying Enrique Iglesias and Taylor Swift songs in her mind. It may have been the music that kept her focused, or it may have been that she drank most of her water. Good going, either way. 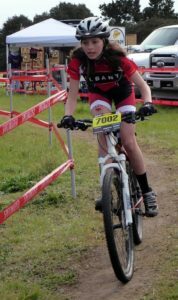 This is a good spot to point out that Albany sophomore girls took 5 of the top 11 spots out of a field of 20 riders. That’s a really strong group! 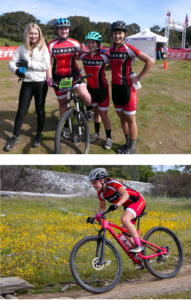 Freshman rider Alexa moved up a couple of spots from her Ft. Ord results to finish 8th after two laps, in 1:21.54. 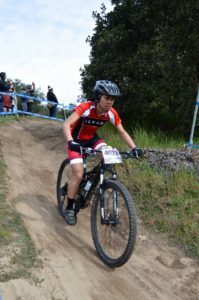 Her teammate Anjelou crossed the finish line three minutes later in a heated sprint for 12th position. In her previous race at Ft. Ord, Anjie crashed out. What a great turnaround! Sophomore boys had mixed results this week. However, even with continuing technical problems, Liam B. had an outstanding race, up front in at least third the whole time, but dropping to 4th due to mechanical issues in the last half of the third lap. He couldn’t shift so he jumped off the bike to run up every hill. Way to tough it out, Liam! The next Albany riders to cross the finish line in Sophomore D1 boys were the well-hydrated Tyler in 10th at 1:30:07.56 and Liam T. moving up to 12th at 1:41:35.58. On the way, he later reported he had fallen, gotten scraped up, and had a good time. 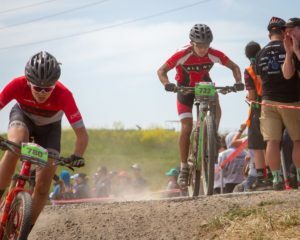 Justin crossed the finish line about five minutes later in 20th position, despite tangling handlebars with a rider from another team and hitting the deck hard. His plan for the next race is to get ahead of the competition. 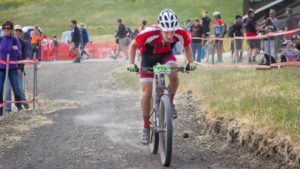 Tristan crossed the finish line in 24th, apparently dealing with something technical, which, considering the effect of crushed granite on drivetrains, is only surprising in how few riders suffered from it. 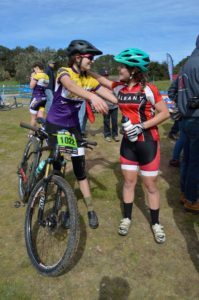 The team’s support at the finish line got an admiring comment from the announcer. Freshman boys also had some fine results, with Matthew completing the two laps in 1:04:24.85, putting him at 14th. Lucas, who suffered through an off-tune singing of “happy birthday” before the race, seemed to have overcome it by the time he got out there. I’m not sure if this is a glitch, but both of his laps have exactly the same recorded time: 38:37.37. Everyone else slowed down between laps, but not Lucas! 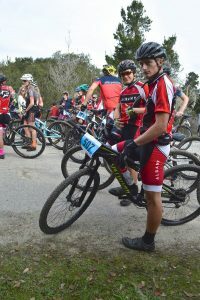 The day finished up with a small field of JV boys riding for Albany, including former Folsom local Zackery, who had recovered from his pre-ride mishap. Niko, looking focused, and Spencer, finishing in a sprint, crossed the line half a minute apart in 17th and 18th positions, followed four minutes later by the erstwhile local, bloodied but unbent at 24th in 1:40:01.12, and teammate Alex crossing the finish line less than two and a half minutes later in his first season race. Good riding! It should go without saying that none of this would have been possible without the investment of time and other, sadly finite, resources by parents, assistant coaches, our awesome sponsors, friends of the team, and Daniel and Robin. 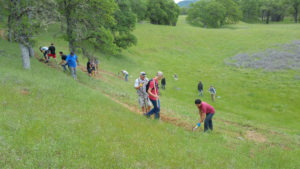 Brian B., Skyler, and Jim Z. volunteered with NorCal to make the course safe for all the riders. John took some excellent pictures. Dana, Peter M., Anthony, Steve, Marion, and Skyler shared the work at the feed zone. Parents helping around the tent included (but were not limited to) Joan, Linda Botello and Linda Butler, Katie, Ruth, Alesia, Lonnie, Lisa…wait, no men helped out around the tent? (Gotta fix this, guys!) Thanks to everyone who brought food, snacks, and drinks, and to everyone who helped set up or pack away the team’s equipment. It’s worth repeating thanks for the bike repair and maintenance help we got from Jose, Frederic, Daniel, and Dana. Sally oversaw all three rings of this circus without cracking a whip once, and Daniel and Robin spent the day supporting our riders in uncountable ways.